Asif Gul of Orton Park 2nds bowls to Dave Walker of Whittlesey 2nds. Photo: David Lowndes. Ben Graves claimed his first ton for Oundle as they ended Wisbech Town’s perfect start in Rutland Division One yesterday (May 22). Graves cracked 118 in Oundle’s 295-5 at Harecroft Road. He was well supported by Mark Hodgson and Jack Bolsover who both struck 61. Dave Walker batting for Whittlesey 2nds at Orton Park 2nds in Rutland Division Six. Photo: David Lowndes. Samuel Dalley took three wickets in the Wisbech reply of 150 all out. Captain Bashrat Hussain picked up two wickets in his first bowl of the season after injury. Bourne and Nassington maintained their 100 per cent winning records with ease. Rob Bentley smacked 120 of Bourne’s 291 before Tom Dixon (5-39) undermined Barnack’s reponse. Dixon also scored 43. James Pope (69) top scored in Nassington’s 229, although Ufford Park threatened to get home until Wahid Javed (63) was dismissed. Ufford eventually finished 44 runs short on 185 with Adam McDermott taking 4-45 for Nassington. Peter Bibb batting for Whittlesey 2nds at Orton Park 2nds. Photo: David Lowndes. Stamford Town celebrated a first win of the season in dramatic fashion against Peterborough Town at Bretton Gate. Stamford, led by Daniel Robertson (3-37), bowled well to restrict the home side to 158-7 in their 45 overs, but they looked to have thrown a winning position away when slumping to 148-9 from 67-1. But Robertson joined Scott Chamberlain to scramble the winning runs with a ball to spare. Chamberlain struck the winning shot to the boundary. Peterborough skipper Jamie Smith (3-16) bowled with great accuracy, but the lack of a fifth specialist bowler cost his side dear. Abubaker Farooq top scored for Stamford with 32 before he was well caught on the boundary by Smith. Disappointingly games were conceded in Division Two by Medbourne and Oakham with Whittlesey and Uffington the recipients of easy 20 point hauls. 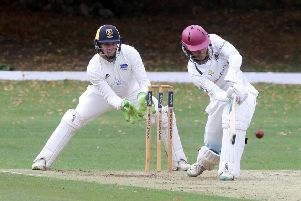 Whittlesey seconds beat Orton Park seconds by 60 runs in Division Six in the game covered by Peterborough Telegraph photographer David Lowndes. Bourne 291 (R. Bentley 120, T. Dixon 43, J. Temple 38, M. Kidd 22, A. Majeed 3-40, M. Shahid 3-58, M. Hammad 2-73). Barnack 184 (M. Hammad 47, M. Shahid 41, S. Amir 40, T. Ahmed 25, T. Dixon 5-39). Town 158-7 (M. Howard 33, K. Judd 31, A. Mitchell 30, D. Robertson 3-37). Stamford 162-9 (A. Farooq 32, A. Hulme 30, A. Birch 27, S. Appan 20, J. Smith 3-16, K. Medcalf 2-20, F. Adil 2-57. Nassington 229 (J. Pope 69, H. Craig 35, D. Bandaranaike 33no, A. McDermott 29, A. Bandaranaike 26, W. Javed 4-41, J. Neville 4-70). Ufford Park 185 (W. Javed 63, T. Hart 34, J. Harrington 28, A. McDermott 4-45). Oundle 295-5 (B. Graves 118, M. Hodgson 61, J. Bolsover 61, G. Freear 4-69). Wisbech 150 (D. Haynes 40, J. Esser 35, J. Hargreaves 30, S. Dalley 3 wkts, B. Hussain 2 wkts).